Judging by the pained expressions of all 3 men on the podium, no one had known Lesley Garrett was going to be belting out God Save The Queen in a Union Jack evening gown. Perhaps it confused Bradley Wiggins’ plans. 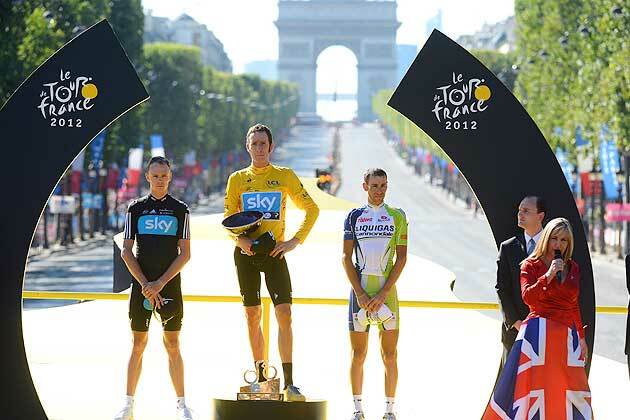 But by the time he took to the winner’s podium on the Champs Elysees yesterday he and his team had known for at least 24 hours that he was going to become the first Brit ever to win the Tour De France. His lack of a decent speech after a glorious win seemed to epitomise some very British problems with occasion. It was an occasion that needed a few appropriate words. Just a few. And in French, too. No groom would expect to get away with joking about doing the raffle and not getting drunk on the way home at his wedding anymore. And Bradley, we wanted you to take the time to enjoy your moment, but also acknowledge it and share it with us in words. Meryl Streep once told me she forgot to thank someone important when she won her first Oscar and she felt so awful after, when she saw his crest fallen face. So you should always have a little list of thank yous to the family and friends who supported you. Just In Case. This is not arrogant. It is kind and cool. And Bradley, you knew you were going to win. We all knew. Unlike most Brits, Bradley Wiggins speaks fluent French. He’s a man whose excellence came only through drive, talent and relentless hard work; not class advantage. Unlike the products of the nation’s public schools who get taught public speaking and debating in anticipation of a career in public life or the City, he hasn’t expected to talk his way into a valued position. He seems refreshingly unpretentious and focussed on elite achievement in a sport that has been take up by tens of thousands of amateurs over the past 10 years. But while he deserves credit for remembering to thank his incredible single mum, who raised him in difficult early years, and mentioning a great achievement for British cycling, his very brief comments were a missed opportunity. Bradley, the French have embraced you for your authentic Britishness. They love your sideburns and your devotion to your Mod-ness — vintage Vespas and all. A brief “merci” to the French nation would have been enough, but with your fluent French he could have surely said more. Especially after Lance Armstrong managed to mispronounce the term for yellow jersey maillot jaune so appallingly, and thereby have it turned into his French nickname; Mellow Johnny. And not in a good way. France, many of us are taught in school, is a country where a polite “bonjour, monsieur/madame” can preface even the smallest of transactions in the corner shop. It would have cost nothing, but meant to much to our Gaullish friends to have shown a little politesse on this occasion. It was still a glorious moment, seeing Bradley win. But a few bons mots can seal a victory in the loveliest way. This entry was posted in Culture, France, Sport, Uncategorized and tagged Bradley Wiggins, culture, cycling, FTW, sport, tour de france. Bookmark the permalink.